watching trains like this chessie roll by my house is what really got me interested in model railroading, it didnt matter what i was doing...when i heard that horn sounding id tear out of the house and run down to watch the coal drags and occasionally a freight rumble by. its not the most photogenic loco in the world, the black & white paint scheme isnt particularly eye catching....but standing next to a gp50 is impressive!!! the gp's and the f series are my favorite types of loco.....i like the clean lines of the e series passeger locos too, call them powered box cars if you like, but theres no denying theyre impressive pieces of machinery. If you click on the Bachmann Union Jack you will see the Flying Scotsman Limited Edition in O Gauge contributed by Bachmann Europe to the National Railway Museum, York, to raise funds for the Museum. A very nice and appropriate gesture by Bachmann Europe. LD303 : I chose history as the theme for my contribution that might interest readers. It did not seem appropriate for your contribution, so I suggested horsepower or tractive effort. I still know nothing about the GP's. your title is misleading seasalt.....it doesnt say anything about what sort of loco or anything about specs. and history, it simply asks for pic posts and reasons for liking the chosen subject.....i stated the reason i like what i like...if you want a steam only thread you need to make one and let this one go where it will. LD303 : So, now you know. While agree that it is time to put the bickering on this thread to an end, I must agree, to extent, with LD303. After all, the original post does say favorite loco , post pic, and why. That is why I bothered to post a picture of the NH&I Railroad's GP30 for LD303 for him. As for myself, I could have just as easily found a pic of an Alco RS1, 3, or RSD4/5 as they run an extremely close second to steam for me. I have always enjoyed being a part of this forum but over the past two weeks there seems to be far tooooooooo much back biting, etc. To anyone who wants to start a thread like this, try to make your intent as clear as possible. Even though I grew up in the very end of the steam era, and know that the word loco meant steam, and diesel meant just that, diesel, I think that difference has been lost of the world as we just seem to use so many words to mean multiple things. I have enjoyed this thread, even with the ones who cannot post pix. So let's move on and have fun, as the BMan always says. the ones I listed, and a few mentioned by ebtbob, where the ones that "did it". They showed the railroads that diesels could do the job, better actually, with less down time and lower operating costs. The EMD F3 and GP7 where remarkable examples of simple reliable engineering that spent very little time in the shop. They where the model A Fords of the railroad industry. Not the fanciest, not the most powerful, but they started, ran and did their job, day in and day out. Like I have said before about automobiles, if I want to go fast in comfort I would buy a BMW, but to get their every day with a load of materials I will take my F150 every time. And, EMD saw the big picture better than anyone. They knew simple meant reliable and interchangable parts meant easier repairs and up grades. Facts that made them the undisputed leader for 40 years. Thats what is so cool about diesels, especially first generation diesels, they are simple, functional work horses - and railroads, above all else, are instruments of work, capitalism at its best. Well said, atlanticcentral! I agree with you - the best diesels are the simplest ones. EMD used variants of the 567 prime mover for 25 years, then they modified it into the 645. I'm into antique tractors also, and they're PAINFULLY simple, but they just won't quit! No fancy computers or anything, just the bare essentials to get the job done. 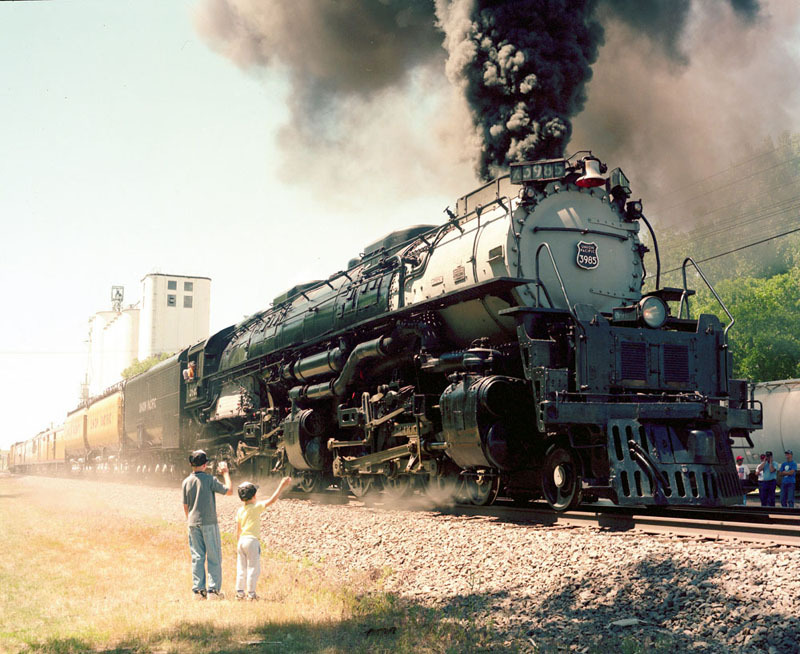 I'd have to say my favorite locomotive is the UP 4-6-6-4 Challenger, because of its "shock & awe" power - a total weight of 1,071,000! I knew some of that, but some I didn't. 2 out of 8 indoors - understandable 'cause they're sooooo big! My favorites would be pre-1900 steam. What are diesels other than different colored boxes with the only visible moving parts being rolling wheels?